Arguably the most well-known of the Aesir, Thor was also called Donar, his name literally meaning “thunder”. He was the son of Odin and Fjorgyn, the husband of the goddess Sif, and father of Thrud, Magni, and Modi. Thursday is named after him. In Asgard, Thor lived in Thrudsvangar with his family and two servants, Thialfi and Roskva. 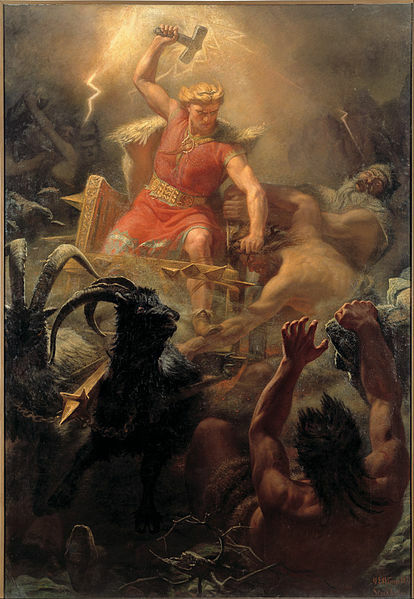 He possessed a hammer called Mjöllnir, which always hit its target and returned to him when he threw it, a chariot drawn by two goats, a belt of strength,and iron gauntlets to enable him to handle his hammer with its red-hot handle. He was a powerful and temperamental god, energetic and honest as well as rather naive, making him easy to trick and quick to anger. Physically strong and imposing, he was red-haired and bearded, signifying his fierce temper. As the mightiest of the gods, he was their champion and protect or against the frost giants and other enemies. Because of his size and strength, he was very dangerous when angry, and had an impressive appetite. As a weather god, he was often called on by sailors and travelers, and he was a patron god of the common people or freemen. His straightforward attitude and charisma made him popular, and stories about his exploits abound. For most of his life, Thor consi dered Loki one of his closest friends, enjoying the trickster god’s company and trusting him more than most of the other gods did. Together,they traveled to Utgard, where they and Thor’s servant Thialfi engaged in contests with the giants there. They lost every contest, which angered Thor, until the giants admitted to using magical trickery in order to win; in fact, Utgard itself turned out to be only an illusion, projected by the giants because they were too afraid to meet Thor in person. Thor’s friendship with Loki often proved troublesome as Loki manipulated or persuaded Thor into difficult situations, and left it to him to get them back out of trouble. When captured by the giant Geirrod, Loki agreed to lead an unarmed Thor to Geirrod’s hall in return for his freedom, and successfully tricked Thor into coming along. In the ensuing fight, Thor killed Geirrod’s two daughters, Geirrod himself, and all of the servants. Loki’s trickery usually made Thor angry, but his anger never lasted long, and in the end matters were usually resolved to his satisfaction. At one point, Loki cut off and stole Sif’s long, golden hair, which enraged Thor. Forced to make amends, Loki procured not only new hair for Sif, but also other presents for the gods, including Thor’s hammer Mjöllnir. The hammer was later stolen by frost giant Thrym, who demanded Freyja’s hand in return for it. Loki and Heimdall devised a plan whereby a reluctant Thor dressed up as Freyja, with Loki as his bridesmaid. Thrym was suspicious of Thor’s size,massive appetite, and fiery eyes, but Loki had an excuse for everything and Thrym fell for the deception. As soon as he handed over Mjöllnir, Thor killed him and his people. Thor’s greatest enemy was Jörmung and, the world serpent and son of Loki. He failed to kill Jörmungand once, but the two would meet again at Ragnarok, where Thor was destined to slay Jörmungand and then die himself from the snake’s venom.